(taps mic).... Is anybody there? I haven't blogged in ages, but I did want to pop-in to share a printable I've been working on for my kids. 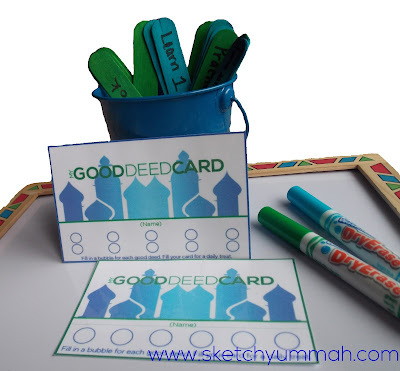 Good Deed Cards! This year we'll be using Silver Envelope's Rockets-n-Robots countdown calendar, and I decided to try my hand at Adobe Illustrator to make a few things to go along with it. The way this calendar works is you have thirty small bags, and the kids open one each evening/day. The bags each contain a puzzle sticker to add to their poster (eventually revealing the Eid message). 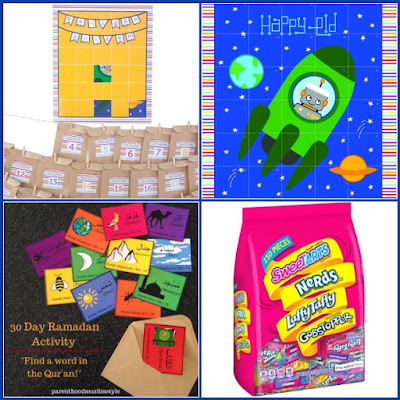 I'll also be adding the Find a word in the Qur'an cards from Parenthood Muslim Style, and a candy for each kid. They'll need to fill up their Good Deed Cards throughout the day, in order to earn their daily treat. I found this cute little pail in Target's $1 Spot and filled it with suggestions for good deeds on the popsicle sticks. I designed the Good Deed Cards so that big kids have 10 good deeds to complete and smaller ones have 6. You can print a bunch and use them as punch cards or laminate them to use w. a dry erase marker. I recommend the Crayola dry erase, as they are the only brand I've found so far that doesn't have that awful dry-erase smell. If you're interested in more printables our 'Secret Du'a formula" is a good one, which we'll be revisiting this year as well.